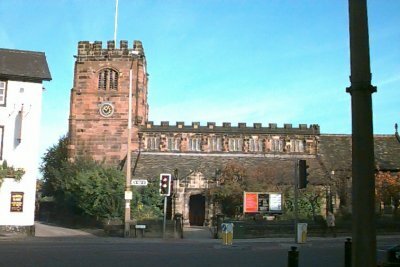 St Mary's Parish Church, Cheadle Cheadle Parish Church was a well-known evangelical Anglican church on the outskirts of Manchester. Our first meeting there in 1964 possibly came about through Rev John Mockford (minister at St Leonard's Bootle), who was probably an old Cambridge/college buddy of Rev Jim Ayres (minister at Cheadle Parish Church). In September 2002, I received this e-mail from Paul De Barr - erstwhile member of Cheadle Parish Church. Hi, Eddie, How incredible to find your website. I was looking to buy a guitar again and just thought that there may be some mention of a type of guitar I used to have in the 60's, a Hofner v3. This led me to your site. You may be interested to know that I was at the gig you did at Cheadle Youth Club on 29th February 1964 and that night cemented my social life for the next 5 years. Myself and some friends in YF had already formed a group (as everybody did in those days) and had played at the youth club, with our Spanish guitars and boxes etc. But after your gig we got serious and followed the same road that the Seekers had and formed a Christian group attached to Cheadle YF, called The Vigils. (Dreadful name I know). I think you may possibly remember us. Certainly some of the names and places on your website are familiar to me. We too toured the North West to place like the Lighthouse and the Catacombs a few times. There was a similar place in Leeds we went to . I remember we won a competition somewhere, Chester I think. I remember Dave Eastwood, wasn't he a Radio Manchester DJ?. The group members were myself, Paul De Barr on Lead Guitar, Chris Mosley on Bass Guitar, Pete Rose on Rhythm, Phil Watson on Drums, Graham Nicholson on Keyboards and John Cambell as lead vocalist. Half of us live on, and are the best of friends - and I mean that. Pete and I and our wives, (who we also met as a consequence of the group) and Chris, whose wife sadly died a few years ago, meet at least once a year for a New Years bash and also during the year if we can. I'm off to Crete in May with Chris for a walking holiday. Graham I think has moved back to his roots, and last I heard was Director of Cultural Amenities in Stockport. He was the real talent and used to write a lot of the songs. Paternal pressure put a stop to my musical pastimes. I was replaced by a Jimmy Hendrix stylist called Ant Spencer and the group then changed it's name to Time and Space. To keep the group going I sold my Hofner V3 to Ant and that was a decision I have regretted to this day. Hence my search on the web. I had many friends in YF and they are friendships which have lasted. One name on your list of prayer partners was Barbara Milne of Demmings Road. Well, she married another YF member, Derek who sadly died last year. But Pete and Myself and our wives, and probably some of our children, Chris and Barbara are all meeting up in Coniston on 12th April to commemorate a lakeside bench dedicated to Derek. So I will tell them about your website, I'm sure they will be as fascinated as I was. Like the Crossbeats, the Vigils started up with rubbish equipment. We did not charge, only travelling expenses and it is one of the most wondrous questions in my life, 'Where did the money come from?" We ended up using near top of the range gear and had a brand new Volkswagon van. Amazing. Anyway, I hope this little story is of interest to you.